January 29, 2019 – The much delayed construction of NSSF’s $110 million Pension Towers development finally kicks off in March even as the selection of a Chinese civil contractor to put the brick and mortar together runs counter to the much acclaimed BUBU (buy Uganda build Uganda) policy. China Railway Construction Engineering Group beat sixteen construction firms to the deal, including home grown Roko Construction which executed the first phase of the project. Conceding that the main contractor eschewed the BUBU policy, NSSF Managing Director Richard Byarugaba said a requirement for contractor finance had knocked out local firms that might have been technically capable but were financially constrained. “Hiring a Ugandan firm would have been desirable but we needed someone that could finance the construction of a UGX 300 billion project from their own resources because we are not putting up the money upfront,” he told 256BN. The BUBU shortfall however, is compensated for by the architectural, civil and structural as well as the electrical and mechanical engineering subcontracts, all which went to local firms. Renown architectural firm Sentoogo&Partners retained the Architectural design contract while SurveCon Associates were retained as quantity surveyors for the project. Seka Associates are the Civil and Structural engineers whole Multiconsults will oversee the electrical and mechanical works component. The $110 billion price tag includes the cost of finance. The contractor has 38 months including a two month contingency period to hand over the keys of the 75,000 square metre building spread across 32 levels. The clock starts ticking March 1. 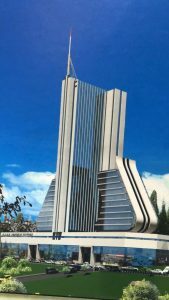 Even though it may not feature high up in the regional height league, it will be the tallest and biggest building by floor area in Uganda and among the biggest in the East African region. NSSF is back to play in the real estate sector with $600 million earmarked for investment in commercial and residential building including the delayed low-cost housing developments in Nsimbe and Temangalo. Uganda adopted a buy Uganda build Uganda BUBU policy in fiscal 2017 as a way of boosting demand for factors in the economy and clawing back against capital flight. The policy has had notable impact in the wood-working sub-sector where artisans have upgrades skills and quality to level sufficient enough to meet corporate and government demand for office furnishings.